25,000 points Earn 25,000 bonus points when you make at least $1,000 in net purchases within 60 days of your account opening which can be redeemed for a $250 statement credit towards travel purchases. 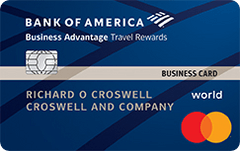 3X Earn 3 points per every dollar spent on travel purchases (car, hotel, airline) booked through the Bank of America® Travel Center - powered by Expedia®. 1.5X Earn unlimited 1.5 points for every $1 spent on all purchases everywhere, every time-no matter how much you spend. Points don't expire. Sign-up bonus with no annual fee. For a no annual fee card, the 3X points on travel purchases are quite high. That includes car, hotel and airline booked through the Bank of America Travel Center. Also earn 25,000 points after only a $1,000 spend within the first 60 days. Earn 3 points per every dollar spent on travel purchases (car, hotel, airline) booked through the Bank of America® Travel Center – powered by Expedia®. Our take: With a healthy 3-point bonus on travel purchases and a 1.5-point bonus on everything else, this no-annual-fee travel card gives business cardholders ample opportunity to stockpile a large number of points just by using their card for everyday business expenses.